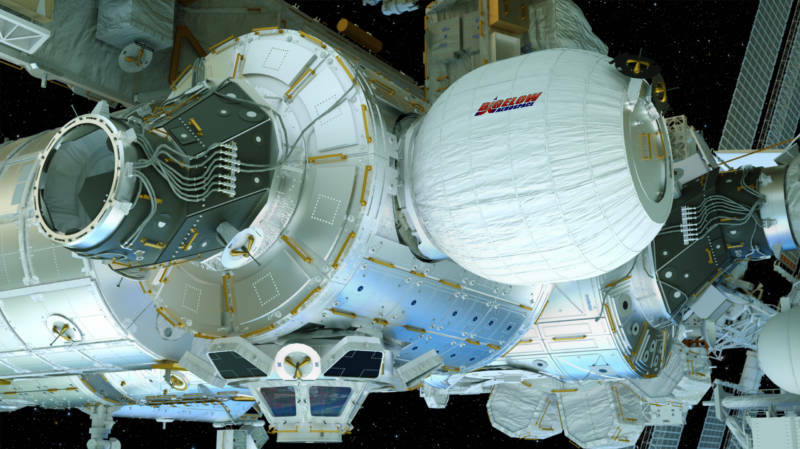 The module is called BEAM, Bigelow Expandable Activity Module. It's a prototype of what could be a new kind of living quarters in space. The advantage of an expandable module is that it can be folded so it takes up less room in a cargo rocket, and then expanded once it reaches space. Folded up, BEAM looks like a partially crushed tin can, about 7 feet long. Inflated, it looks more like a 13-foot-long watermelon. At first, everything seemed to go well, as the restraining straps around BEAM were successfully released. Then, ground controllers told space station astronaut Jeff Williams to open a valve for a few seconds at a time to transfer air from the station into BEAM. The problem was, nothing happened. BEAM refused to budge. After a couple of hours of injecting brief bursts of air into the module, NASA ground controller Jessica Meir gave Williams the bad news. "Unfortunately, we're going to have to stand down with the BEAM operations today," Meir told Williams. "We've been assessing all the parameters here from the ground, and due to our set of no-go conditions and not seeing any noticeable movement, we're going to have to reassess further from here." After they examine what the data tell them about today's attempt, ground controllers could restart the inflation process as soon as Friday. BEAM was made by Bigelow Aerospace based on a design that NASA architects and engineers came up with in the 1990s. The space agency was trying to figure out how to get astronauts to Mars, without the crew going crazy living in a tiny capsule for months on end. The inflatable is not like a balloon. It's made of multiple layers of Kevlar and other materials resistant to micrometeorites. The plan is to leave BEAM attached to the space station for two years. Astronauts will enter a couple of times a year to check on instruments, but there are no plans for them to have a sleepover. After that, it will be detached and allowed to burn up in Earth's atmosphere.